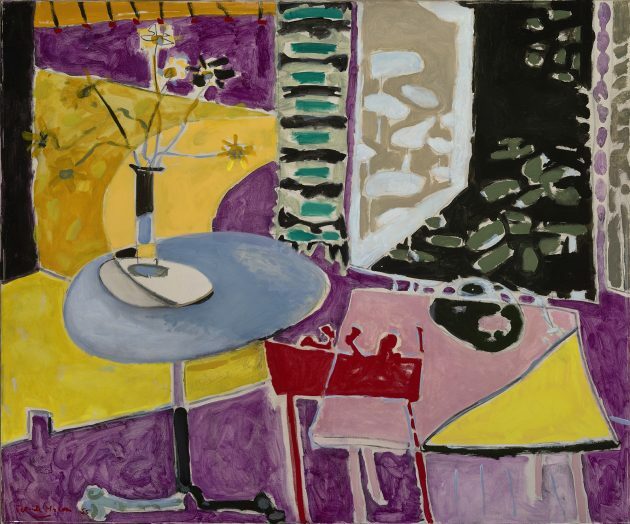 Long Cadmium with Ceruleum in Violet (Boycott): July- Novemher 1977 is the largest of a series of canvases Heron made for an exhibition at the University of Texas where he was Doty Lecturer in Fine Art for 1978; and it is, in fact, very large: 13 by 6'/2 feet, to be precise. Boycott comes into it, apparently, because just as Heron—radio playing in his studio—was about to begin a nine-hour stint of laying down the red background in oils, the batsman was walking up to the wicket to open the innings against Australia. All very English, and quite right, too. And just what Heron takes to be good painting, let it be said, is a contentious matter. For, back in the 1950s, when he was also a practising art critic, Heron was locked into a heated polemic against John Berger. Heron was essentially arguing for ‘The Autonomy of Art’, which he tended to associate with the pursuit of abstraction, the work of certain St Ives painters, and (at that time) with a defence of the new work coming out of America. Berger then advocated a modified socialist realism; he emphasized ‘social relevance’ and subject matter, and reacted negatively to most abstract painting—especially that coming from America. Heron thus told his Texas audience that, in 1955, he considered ‘J°lm Berger’s Marxist criticism . . . the main threat to major painting in my country’. And what did Heron himself think major painting should be like? Well, it seems, rather like Long Cadmium. For example, in 1953 Heron wrote that ‘the secret of good painting . . . lies in its adjustment of an inescapable dualism’—that between the illusion of depth, and the physical reality of the flat picture- surface. ‘Good painting’, he claimed, ‘creates an experience which contains both. It creates a sensation of voluminous spatial reality which is so intimately bound up with the flatnesses of the design at the surface that it may be said to exist only in terms of such pictorial flatness’. Long Cadmium is, of course, rooted in this dualism: it also clearly draws its strengths from that response and commitment to colour which led Heron to declare, in 1962: ‘It is obvious that colour is now the only direction in which painting can travel. Painting has still a continent left to explore, in the direction of colour (and in no other direction)’. Does the fact that Long Cadmium is an enjoyable painting mean that, in those debates, Heron was right and Berger wrong? I do not think so. Today—with the advantage of hindsight—I don’t agree with what either of them was saying then. John Ruskin used to draw a distinction between what he called ‘aesthesis’ (or the response to sensuous pleasure) and ‘theoria’ (or the response to beauty of one’s whole moral being). It must be emphasized that, for Ruskin, ‘morals’ meant much more than narrowly ethical considerations: the word for him embraced all that we would now identify under such categories as human emotions, ‘structures of feeling’, and the whole rich terrain of symbolic thought. Now Ruskin has been much derided for this distinction: but unless one is prepared to argue that the response we have to a beautiful red silk scarf, is in every significant respect equatable with our response to, say, the Sistine Chapel, then it must be admitted not just that Ruskin had a point, but that it was a very good one indeed. 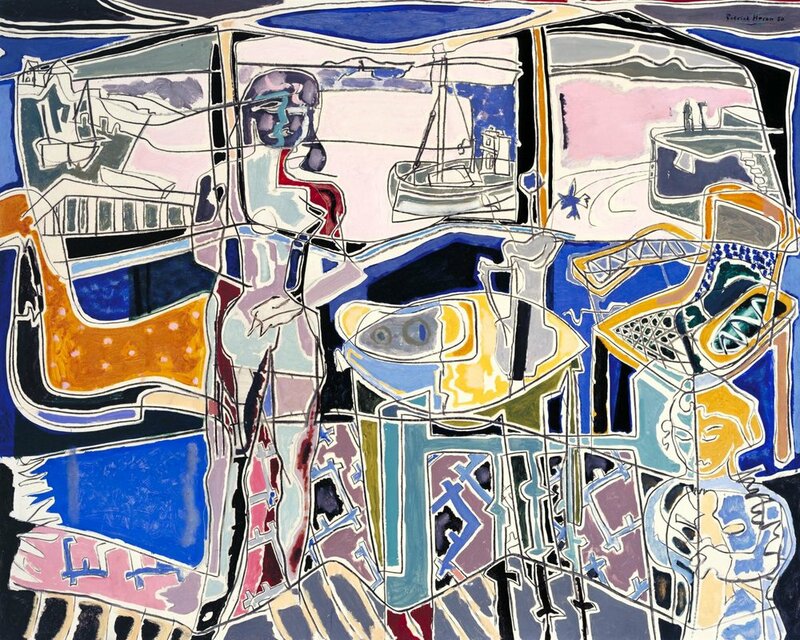 Now it seems to me that painting like Patrick Heron’s is in pursuit of pure ‘aesthesis’. Indeed, that, I take it, is what Heron is trying to say when he writes such things as, ‘concepts and also symbols, are the enemy of painting, which has as its unique domain the realm of pure visual sensation. Painting should start in that multi-coloured, and at first amorphous, texture of coloured light which is what fills your vision, from eyelid to eyelid, when you open your eyes. The finished painting should also end in pure sensation of colour—having passed into the realm of the conceptual in the process, and come out again at the other side . . And so forth. Ruskin himself took a dim view of pure ‘aesthesis’ (hence his quarrel with Whistler). He said something about taking no notice of the feelings of the beautiful which we share with spiders and flies. But I cannot see that there is anything morally, politically, or aesthetically wrong with a quest for an art which gives pleasure through visual sensation alone. Indeed, at a time when, culturally, we lack the sort of shared symbolic order which religion once provided, good decorative surfaces (which are as rare as they are desirable) are very often of this kind. Heron is a good decorative painter—as the successful application of his designs to wall hangings, and carpets for the Cavendish hotel, bears witness. But—whatever Heron says—this is not the ‘only direction’ for painting; indeed, that language of pure form, enjoyable for its own sake, is peculiarly difficult (and perhaps impossible) to arrive at on the canvas surface. Because we are not spiders and flies, all our sensations and experiences tend to be subject to imaginative and symbolic transformations. The greatest art of the past and the present has always recognized and made full use of this fact. Heron may think that I am thereby seeking to minimize the importance of those ‘abstract’ elements in all painting on which he places such emphasis. Not so. I firmly believe that the greatest painting is always rooted in a mastery of ‘aesthesis’: in other words, Giotto’s blues were unrivalled in his time, but he offers us rather more than an unrivalled sense of blue. Indeed, his blues appear as good as they do, not just because of the physical sensations to which they give rise, but as a result of the affective (or symbolic) resonances which such blue has within the context of his painting. More than once in the course of his Doty lectures, Heron reminded his Texan listeners that he was friendly with the late Herbert Read. He failed, however, to point out that it was Herbert Read who first suggested that the formal values which Clive Bell and Roger Fry (and it would seem Heron himself) expressly dissociate from symbolism—through such concepts as ‘Significant Form’—might themselves be symbolic. And this of course explains why by no means all abstract painting need be as closely linked to ‘aesthesis’ to the exclusion of ‘theoria’ as Patrick Heron wants his to be. Rothko said that those who saw only the formal relationships and colour harmonies in his work were missing the point; he referred to a spiritual intention which many can confirm having experienced in front of the works themselves. But plenty of abstract artists have demanded of their viewers responses which were not limited to visual sensation alone, but which involved what Ruskin would have described as ‘their whole moral being’. Even Heron (whatever he says) clearly rises above decorative sensation through the emotive power of works like Long Cadmium. It may be that he himself, however unwittingly, sometimes draws upon such a symbolism of form. And it is for this reason that, just as the social realist critics were wrong to over-emphasize manifest content and subject matter, so, too, Heron was wrong to insist that criticism should be solely formal, technical, and ‘as descriptive of the visual facts as we can make it.’ After all, Herbert Read’s criticism was never like that.